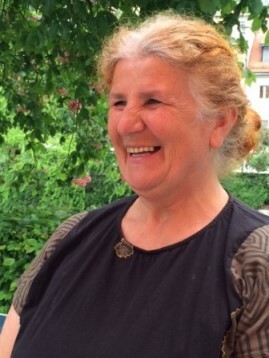 Dr. Ana Krajnc, Professor of Andragogy at the University of Ljubljana, is our new liaison for Slovenia. 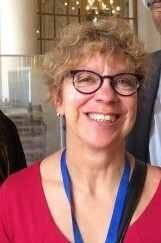 She has a global outlook cultivated at leading universities around the world – Geneva, Florence, Toronto, Ulm, San Francisco, and Oxford and is a tireless researcher in andragogy and the social sciences. 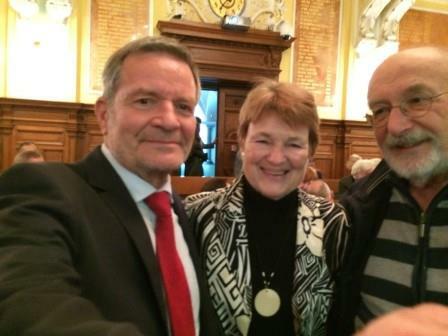 She writes prolifically and plays a very active part as President (since 2006) of the Slovene Third Age University network she co-founded (1985). Read more. Talking to Francis “everyone calls me Francis” is energizing. 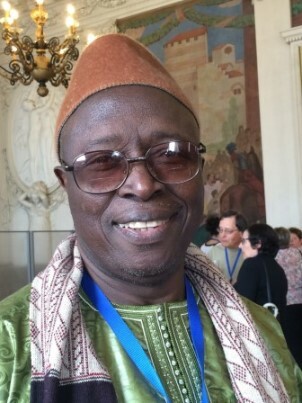 He is Founder and Chief Executive Officer of CDVTA – Community Development Volunteers for Technical Assistance, Cameroon’s leading organization in providing assistance and support to older people. When CDVTA organizes a gathering literally thousands turn up. He is the Country Contact for the Commonwealth Association for the Ageing – Commonage and Board Member of the IFA – International Federation of Aging. He works in close contact with HelpAge and is part of the Alumni of the International Institute on Ageing. Read more. 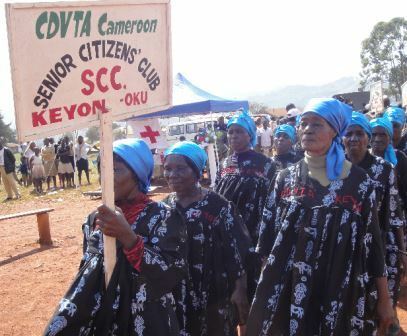 CDVTA is Cameroon’s leading age-care organization, with over 18 years’ successful evidence-based senior-driven, integrated home-based care best practices, through sustainable, replicable community initiatives, promoting advocacy, rights, elder-friendly communities, social inclusion, welfare, work opportunities, and child education for intergenerational linkages and shared learning. See their remarkable achievements here. Keynotes by Ashton Applewhite, This Chair Rocks, on how Ageism warps our view of long life and James Firman, CEO of the National Council on Aging, detailing actionable strategies to navigate longer lives. The program is original and varied and includes Bruce Frankel’s Movement Choir and the Wiser Together Café gathering of 20 olders and 20 youngers exploring partnering across generations for our common future. The Pass It On Network’s UK person on the spot, Dr Vera Mensinga, will be reporting back to the community. The UK is in a period of acute economic, social and political uncertainty. How can economic growth be maximized in an ageing society? How can we strengthen the social contract between old and young? How can we build enough houses for the young and the old? 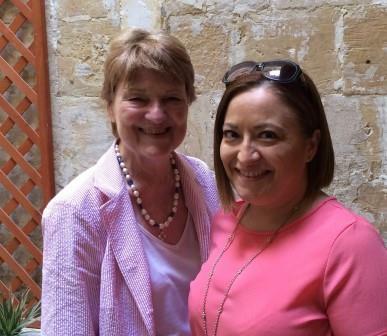 Rosette Farrugia-Bonello (right), Research & Program Manager, seen here with Moira Allan, Pass It On Network’s International Coordinator at the Institute in Valletta. The number of people trained to meet the needs of the steadily aging population worldwide – 20% of the global population by 2050 – is alarmingly and totally inadequate across the full spectrum from gerontologists to informal caregivers. Just one fact – there are only 6,000 geriatricians for 300 million people in the USA. If that’s the situation for a developed country, once can just imagine how much worse it is in the developing world. This is the abysmal gap that the UN set out to fill through its Resolution 37/51 to promote training, research and information exchanges to provide an international basis for social policies and action on aging. Resolution moved to action when, in 1987, the United Nations signed an official agreement with the Government of Malta to establish the International Institute on Ageing (INIA) as an autonomous body under the auspices of the United Nations. In an interview, Dr. Marvin Formosa, Director of the International Institute on Ageing (INIA), explained why Malta was chosen for this new institute. A major reason was because nearly 50 years’ ago, farsighted Malta was the first nation to alert the United Nations to need for an action plan for ageing. 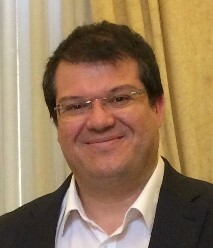 Dr. Formosa, a prolific writer and world renowned for his research in the field of ageing, is a senior lecturer and coordinator of the Gerontology Unit, Faculty for Social Wellbeing, University of Malta. His key interests are critical gerontology, sociology of later life, social class dynamics, and educational gerontology. He is a prolific researcher and writer. His latest book “Ageing and Later Life in Malta: Issues, Policies and Future Trends” gives a remarkable world perspective on the whole issue. The overall mandate of INIA is to empower low-income countries to cope with the challenges of the consequences of mass longevity in the next decades by building capacity for them to be able to educate and train their own personnel to formulate and implement their own appropriate policies. To date, INIA has trained more than 2,000 candidates from 141 countries at the Institute in Valletta, the historic capital of Malta. In 1995 « in-situ » programs were created as an additional avenue and course was held in Cape Town South Africa. These ‘in-situ’ training programs have since increased beyond expectation. To date, 96 have been conducted in 27 developing countries for more than 3,000 participants. To find out more about training opportunities, visit the International Institute on Ageing. 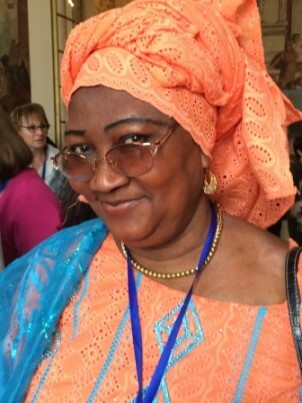 Our Pass It On Country Liaison for South Africa, Lynda Smith, is now on the driving committee of the Healthy Aging Society of Africa – HASOA – a legacy of the second World Congress for Healthy Aging held in South Africa in July 2015 (22 countries/90 speakers). In fact, HASOA is the crystallization of the conference organizing committee. Inspired by the conference success, new objectives are to collaborate with all associations working with aging in South Africa and to network into the African continent. Lynda is President of Refirement Network, a social enterprise engaging older skilled workers to work with South Africa’s youth to find inter-generational solutions to skills building and employment. “We have been inspired each day by the selfless contributions of our dozens of volunteers and AmeriCorps Encore Members, who have devoted a total of more than 175,000 hours of their time–which is valued by the Independent Sector at more than $4.6 MILLION! They, along with our team of incredibly patient and tenacious certified health coverage guides, have touched the lives of nearly 80,000 individuals and families across Metro Denver in so many important–and sometimes even life-saving–ways. Read more at Boomers Leading Change in Health and AGING IS LIVING Facebook page. Caregiving and Aging Reimagined Across Europe (CARE) is the name of an innovative public-private initiative tackling aging realities. Data shows that by 2060, the need for long-term care among Europe’s 80+ population alone is expected to triple. “We are facing a 21st century demographic reality for which we are not yet prepared,” says Michael W. Hodin, CEO of Global Coalition on Aging that has partnered with the EU’s European Institute of Innovation & Technology (EIT) Health and a consortium of partners. Together they have launched the CARE initiative, to share best practices and improve the quality of elder caregiving in Europe. Read more. For more information, visit www.eithealth.eu or contact mmitchell@globalcoalitiononaging.com. View Dr. Edgar Mitchell’s Apollo 14 astronaut’s recent video on sustainability and a strategy to achieve a more optimal future of earth and all its inhabitants. Hear what the young ones are saying. See what you can do. Read here for more information about Dr. Edgar Mitchell (1930-2016). Revisit this new resource! Encore Talent Works toolkit, the go-to digital guide to recruiting and hiring experienced talent. Dr. Hayashida is the Founder and former Director of the Kupuna (Elder) Education Center at Hawaii’s Kapi‘olani Community College, where he developed curricula for both family caregivers and healthcare professionals. Read more. The Encore Talent Works toolkit, a new, dynamic online resource, makes the value of encore talent plain. The toolkit helps nonprofit leaders, hiring managers and volunteer managers recognize and harness the power of encore talent, with practical how-to information, expert resources and success stories. An interactive, searchable map of U.S. encore programs complements the toolkit, connecting organizations with local resources and helping encore-seekers find opportunities. Questions? Comments? Contact Betsy Werley for more information or an interview. 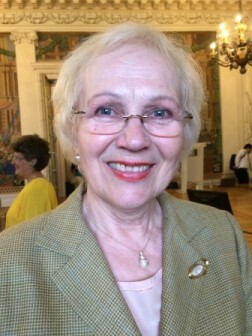 Moira Allan reporting from Ljubljana, capital of Slovenia. What a privilege to be invited to attend the 40th anniversary international conference and listen to speaker after speaker from 20 countries around the world including Australia, Senegal, Colombia, Brazil, Sweden and China, talk of the dynamic growth of lifelong learning. In many ways, the Pass It On Network, is grateful to the U3A. Thanks to member Mr. Hans-Kristjan Gudmundsson in Iceland, we were introduced to Mr. Amoorgum Parsuramen, who is very active in this international body and who became our liaison. In less than two years he has created 22 U3A centers on his Indian Ocean home island of Mauritius, a country that has been top of the African region in the Help Age Global Index for the past two years. In all, 22 countries attended and each related the growth of the U3A associations in their respective countries – a wonderful historical panorama of what has been achieved since the Danish Lutheran pastor Grundtvig (1788-1840) introduced the first Open Schools for lifelong learning. And a wonderful tribute to Professor Pierre Vellas who created the first U3A in Toulouse, France, in 1973, and to his son, Prof. François Vellas who is the president today. The most staggering example of growth came from China. In 1986 there was one U3A with 587 students; by 2015, and with full government support, there were 60 867 elderly universities with 7 643 100 students. Of these, 18 universities had more than 10 000 students, the largest being the Tianjin University for the elderly. Most countries do not receive any financial support and are ingenious in finding ways and means of growing their work. 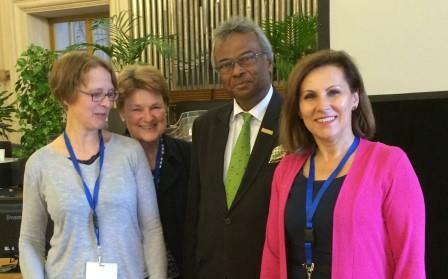 Mr. Amoorgum Parsuramen, Pass It On’s liaison in Mauritius, with Iza Kato (left) and Malgorzata Stanowska (right) from 3UA in Lublin, Poland, and Moira Allan, Pass It On’s co-founder and international coordinator at the 40th anniversary of the U3A in Reims. Iza and Malgorzata are working with Hans-Kristjan Gudmundsson in Iceland on the European Union project BALL – Be Active through Lifelong Learning. TV producer is the new skill, Agnes Mikkelsen, our Canadian liaison for British Colombia has just added to her already rich and varied CV that has strong currents of entrepreneurship and service running through every stage. She sees life as a continuous cycle of growth, and growing into an Elder as a privilege that allows us to give forward. Asked how she found herself to be enrolled in a TV producer’s course just before her 75th birthday, she said the spark came from the Pass It On Network. “I read about the senior TV team that had been trained at the Tuymazy TC Center in Bashkortostan, Russia, and thought that was wonderful. “Shaw, I learned, has a policy of training members of the community to produce their own TV shows for their community channel. They have been doing this valuable work for eight years. When I walked out of the office, it was with a curriculum and a date for my first lesson! I was really excited. “I loved the training. It was an intensive course of 8 full days over 8 weeks. I learned how to operate a camera and so much more; all about lighting, for example, and then there was a whole day on microphones before we went onto how to structure a program, the art of interviewing and the whole issue of editing. “Part of the deal was that we had to pay back with 8 weeks of service for a community project. “I shot my first program in May. It was about the Chilliwack Senior Consultants, a remarkable peer-to-peer program that trains seniors to be consultants to their peers. The program is run by a rather remarkable young lady who is working very hard for the seniors of Chilliwack. “We are waiting for camera time for our next available filmings.” said Agnes. As soon as it becomes available, we’ll be sharing Agnes’ first program with you. “The choice for seniors shouldn’t be between isolation and institutionalisation,” said Mr. Marjan Sedmak, city counselor of Ljublajana and President of Age Platform, in an interview with the Pass It On Network. 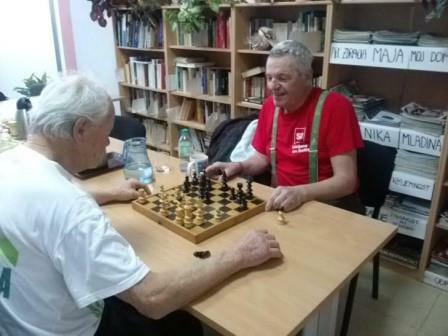 “Twelve years ago there was nowhere in Ljubljana for seniors to get together on a regular basis and develop their skills and activities. Today we have just opened our 7th senior center, and we aim to have one in each of our 17 territorial units within the next few years. “The city supplies the infrastructure – the kitchen is vital for building community – and a small administrative staff. 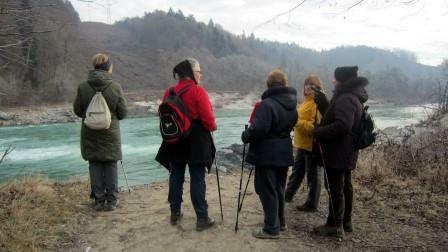 Seniors are part and parcel of the programming of activities and often create new ones. For example, if someone wants to find out how to transfer photos from a telephone or tablet and can find 5 other people interested in the same topic, we’ll co create the activity with the group. “Activities are varied and run from the physical – yoga, tai chi, hiking – to languages – the romance languages and modern Greek are very popular – personal development, and creative activities – painting, drawing, handwork. “We are learning and creating all the time,” he said. I met Tania Gobec while strolling among stands at a Water Week celebration along the banks of the Ljubljanica River in Ljubljana, winner of Europe’s Green City award for the second time running. Tania is a farmer and has been all her life. She was upset about the fact that city children don’t know where flour comes from. So she decided to show them. 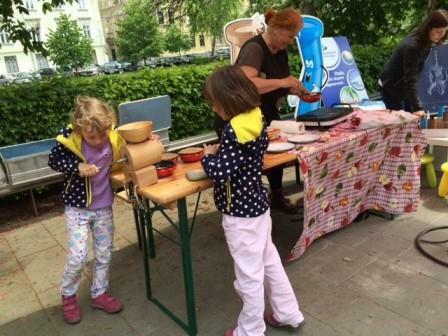 She set up a simple, portable see-touch-crush-grind-eat demonstration and started taking it to different ecology events. She has a simple bowl of wheat, invites children take a handful, feel it, then stone crush and grind it. She then mixes the resulting flour into a dough, cooks it on the spot, fills the pancakes with her own homemade apple-quince jam and the children eat the result and leave licking their fingers and mulling over a new understanding of how the world works. Nobody asked her to do this; she took the initiative. Today she’s built quite a reputation for herself and schools invite her to involve their students in her live demonstrations. She’s even earning some money from initiative.